My aunt used to make me jars and jars of sambal belacan to bring back to North America with me every time I go home to Malaysia for holiday. 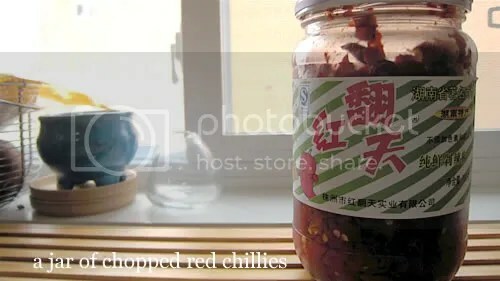 I had decided that I should learn to make it myself and luckily with the advent of the Internet, I found many sambal recipes posted online by fellow Malaysians locally and abroad (like me). I had previously posted a version of nasi lemak last year, served with sambal telur instead. Soak the tamarind pulp in warm water for 15 minutes or more. Squeeze the tamarind constantly to extract the flavor into the water. Remove seeds, drain the pulp and save the tamarind juice. Slice onions into rings or half rings. Pound or grind the prawn paste together with lemon grass, shallots, garlic, and chillies. We will call this the spice paste. Heat 1/2 cup of cooking oil in a hot wok. Do not skim on the amount of oil when it come to making sambal or curries. Good curries and sambal has a layer of spiced oil on top of them when they are done. The fat is necessary to bring out the taste of spices. Fry the spice paste until fragrant. Add tamarind juice, sugar and salt. Some people like their sambal sweet. Use as much sugar as needed. Let the paste cook while stirring occasionally. It is ready when oil from the paste floats to the top. This is called ‘pecah minyak’ in Malay. You can choose to ladle off the layer of oil before serving, or if you are keeping them for future use in a jar, keep the layer of oil to preserve the flavour. Like all curries or anything spice based, they get better the day after or even longer, if stored properly. 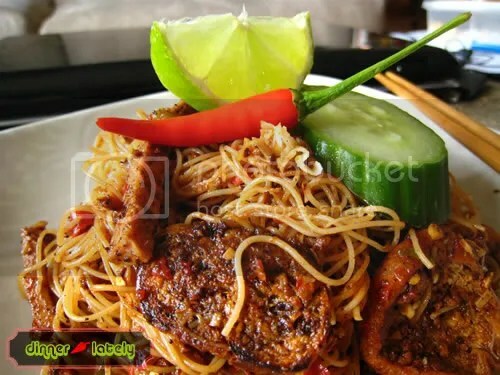 This is a very much missed dish for those living overseas who originates from/have lived in/been to Kuala Lumpur (KL). It is amazing how the mamak stalls that are a familiar sight at every corner of KL have come up with the creation of the infamous MAGGI GORENG. Maggi is simply a very popular brand of instant noodles in Malaysia, and “goreng” means fried in Malay/Indonesian. By the way, there is not a time of the day whereby Maggi Goreng is inappropriate to be eaten. You can have it for breakfast, lunch, dinner, tea time, or late night supper, and I am not exaggerating. Maggi noodles were originally a soupy noodle dish that is ready in about 2 mins (as advertised) but by cooking the noodles until al dente in a pot of water and then frying them up in the wok with the accompanying seasoning, an egg and a few shreds of vegetables, you will have a plate of spicy, mouthwatering plate of MAGGI GORENG. Just like pad thai in Thailand, no two mamak stalls make the same Maggi Goreng. They always taste different even though it all starts with a pack of dried noodles and a pack of seasoning. For my version of Maggi Goreng this time, I sliced some snow peas for the added crunch (you can use beansprouts also), sliced some fried tofu balls (tau foo pok), some sambal belacan paste, and chopped Thai hot chillis (cili padi). In the chaos of things, I had forgotten to add eggs before turning off the stove and Andy was not very happy about that. 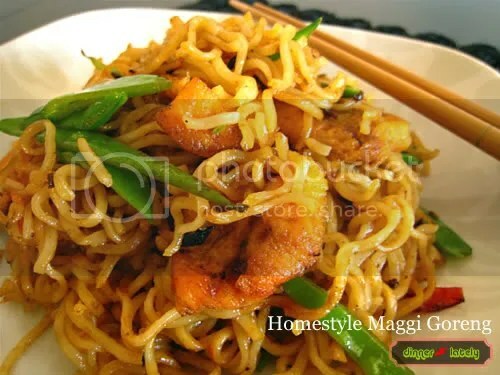 To him and my little sister Chermaine, Maggi Goreng without eggs is outright blasphemy, LOL!. Anyway, I also added some soy sauce and a sprinkle of sugar to improve the taste of the dish. Well, it turned out very well, I must say. Again, Andy downed 3 glasses of milk while polishing up his plate and accusing me of murdering him with my cooking. I made this well-known Nyonya dessert to be shared with my fellow Malaysians at the Malaysian Association of Michigan (MAM) members this morning. This was made last night and it was a lot better. I made the mistake of refrigerating it overnight but I nuked it in the microwave for 45 second and it was fine.Remember to let it sit in room temperature for a few minutes before consuming after nuking it or else you will burn your tongue with boiling gula melaka oozing out from them. I found many recipes only but I chose this one because I did not have to boil, peel and mash sweet potatoes. I also found that the tapioca starch in this recipe also gave it the gumminess it require. 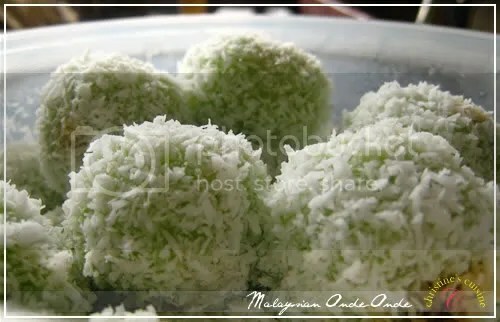 Also, I have to call this Malaysian onde-onde because I found several versions from Indonesia that contains kacang hijau (mung bean) instead of gula melaka (palm sugar). Back when I was just a kid, I knew this as buah melaka. Stir well and knead to form a firm smooth dough. If dough is too soft , add a little glutinous flour. I had to add a bit of water to knead all the flour in successfully. Scoop up the onde-onde with a perforated ladle, dab ladle over dry cloth and then toss onde onde in grated coconut or coconut flakes. Repeat with the rest of the dough, or make them all ahead and then cook them all in a few batches. Some of the sugar may melt and seep through but it’s ok. Yet another creation from spur of the moment. Andy loves to eat asparagus, so I have to come up with fresh ideas constantly to cook his favourite food. 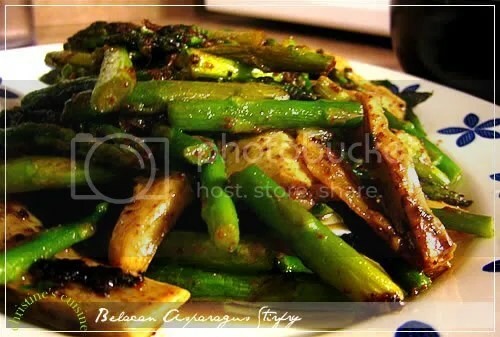 As I was cooking this dish initially, the aroma reminded me of a stirfry dish back home in Malaysia cooked with ferns/fiddleheads (paku-pakis). I remembered that it was mildly spicy and I think there was belacan in it. So just before I dished this out, I sprinkled a couple tablespoons of vegetarian belacan powder (made with fermented tofu) in it and it came out perfect! Heat 2 T of oil in wok. Fry ginger and garlic until fragrant. Add asparagus and cook until semi-wilted. Season with belacan powder, salt, pepper and chili powder if desired. I’ve mentioned that my parents are visiting from Malaysia. Everytime they come to visit, they are tasked to bring my sister and I suitcases full of Malaysian yummies. This time, there were 4 stuffed suitcases that were filled with food-stuff. 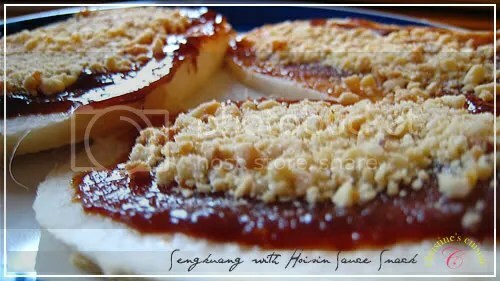 One of them was sweet red “taucu” sauce, which is known as Hoisin sauce in Malaysia. This Hoisin (seafood) sauce is not the black type that is popular in US/Canada. See here for the American version. I cannot find the red taucu/hoisin sauce in this part of the world for the life of me! “Taucu” is a fermented soy bean sauce. I suppose this one that I’ve used is red because of the type of bean used? I find it less salty compared to the brown “taucu” sauce that is usually used to cook fishes and pork. Leave it to the Chinese to come up with a gazillion of soy bean sauces, eh? This is the ultimate healthy snack for me. It brings back fond memories of my primary school days when we rush out the school compound when the last bell rings to signify that school is out for the day. I believe that right outside each school in Malaysia has several junk food peddlers that tempt every school kid into buying snacks, which drove parents nuts because it would spoil the kid’s appetite for proper meals that are being served at home. Sometimes, there are houses opposite the school that take advantage of school kids too. A few of them had set up tables in front of their houses to sell snacks to children to make a few bucks for the day. I didn’t mind it as a kid, the more choices, the better! Most of the snacks sold outside the school are wrapped in plastic, but there are some that are not, such as this “sengkuang” snack. It’s not exactly hygenic because the streets are dusty and buses and cars are usually lined up outside of school, waiting for the kids to be released from school. This is probably why the schools stations prefects (school student police, we call ’em bulldogs) outside the school to take down names of students buying “makanan diluar” (outside food). Maybe a few kids of gotten food poisoning from the snacks, but not me 😛 Having prefects guarding the school compounds made it even more exciting for us to “curi-curi” (sneak) buy snacks, LOL! Oh by the way, sengkuang is called jicama or yambean on this side of the world. My parents told me that it was turnip, they LIED to me for 28 years! Spread taucu manis on one side of the sliced jicama. Sprinkle sugar and ground peanut on top of the taucu merah. Use more ground peanut for added crunch.